Ok I admit it - I'm pretty cheap when it comes to buying shampoo. I used to buy the $1 bottles in college until I figured out that they were indeed pretty crappy hence why they only cost a dollar. I've upgraded slightly since then but I'm still guilty of just grabbing a cheap and good smelling bottle off the shelf without really looking into what it will actually do to my hair. 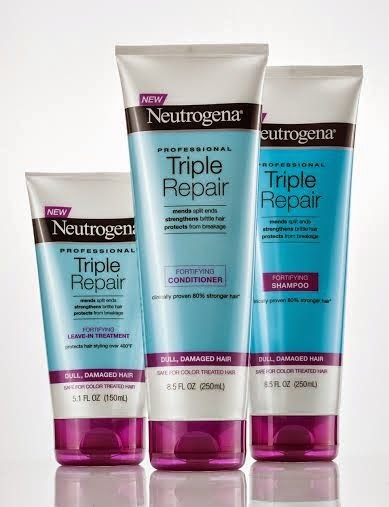 Since I have a pretty crappy track record, I was excited to get the chance to try out the new line of Triple Repair Haircare products by Neutrogena. These new products are SERIOUS. Hair is clinically proven to be three times stronger after only one use of the shampoo, conditioner and leave-in treatment! I've never even used a leave-in treatment before so by adding the leave-in treatment into my hair care process this past week I've noticed a big difference in my hair - I'm pulling a lot less hair out every morning when I brush my wet hair out. The Triple Repair fortifying leave-in treatment actually reduces breakage by 80% which is GREAT for strong hair. Female hair loss/thinning runs in the women in my family so taking this extra step to get stronger hair is an important step for me to getting healthy hair. 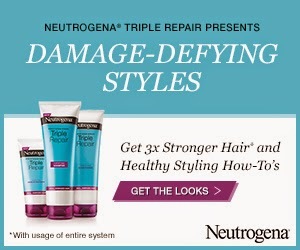 By using the Triple Repair shampoo, conditioner and leave-in treatment tests have proved that this hair care system instantly repairs the the three major signs of hair damage: mends split ends, strengthens brittle hair, and protects from breakage. I generally am pretty nice to my hair: I favor towel drying over blow drying as much as possible and I only use heat to style it every so often for fancy occasions. I know that not everyone is so lucky to have hair that will airdry looking decent though so blow drying and heat styling are a MUST for some. With the new Triple Haircare line, hair is protected against heat styling over 400 degrees (get the style without the damage!!). The system contains nutrient rich conditioners to rebuild hair and protect against heat, color and styling which is great news for anyone with hair coloring damage or heat damaged hair. Does your hair need a healthy boost like mine? Well I've got good news for you....I have a set of Tripe Repair products to giveaway to one of my readers! All you have to do to enter the giveaway is go HERE and use the widget below to leave a comment on this post to let me know which treat is causing the most damage to YOUR hair! Good luck on the giveaway!!! 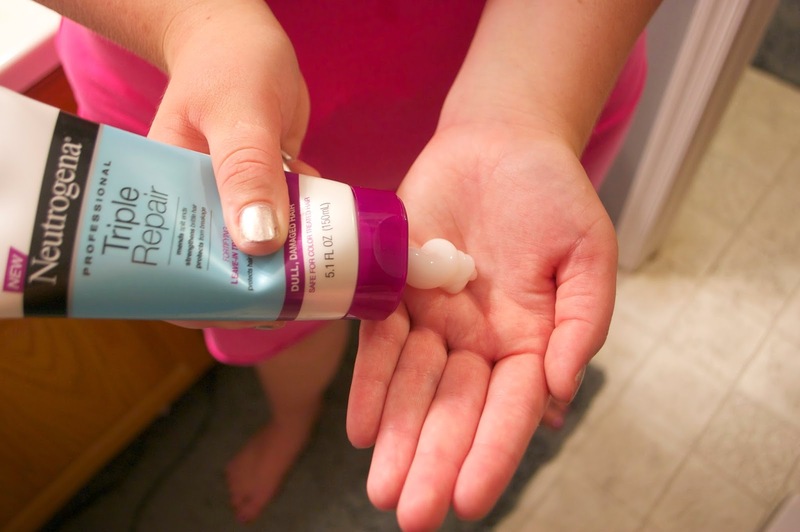 Be sure to like Neutrogena on facebook to keep up with all of their new products! Definitely blow drying. I can't stand the way my hair looks if I let it air dry. Thanks for the giveaway. I guess I'm doing something wrong.... I thought it was ok to comb my hair when it's wet, I usually comb it in the shower while the conditioner is still in and then brush it when it's dry..... I'll have to do some more research! Thanks for the great giveaway! Coloring and processing my hair so much is hard on my hair. I dry my hair with the towel too aggressively when it's wet. I know it causes breakage, but I can't stand waiting for it to dry! Sun exposure is the problem. I'm curious about the products I'd lve to try them!! Hair coloring causes the most damage to my hair. I'm a guy and not fussy with my hair, but trying to win for my wife. I think stress is most damaging to my hair. I'd have to say Towel drying is the biggest threat to my hair.